For tonight’s episode, the producers added a whiteboard of their own to tonight’s show. If that is not clear enough, then consider the title of this week’s episode. Now having Mr. Molaro’s permission to finally reveal its source, I ask you to look carefully at the critical scene of The Raiders of the Lost Ark. These equations come from Indiana Jones’s class room. Spot the problem? 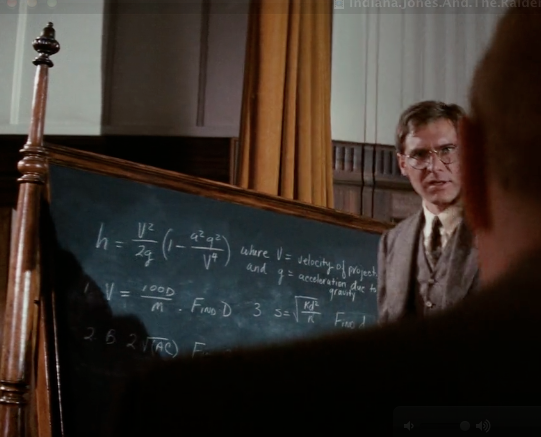 But as impossible as it may seem, it appears the folks at “Raiders of the Lost Ark” must not have had a science consultant — since these equations make no sense. 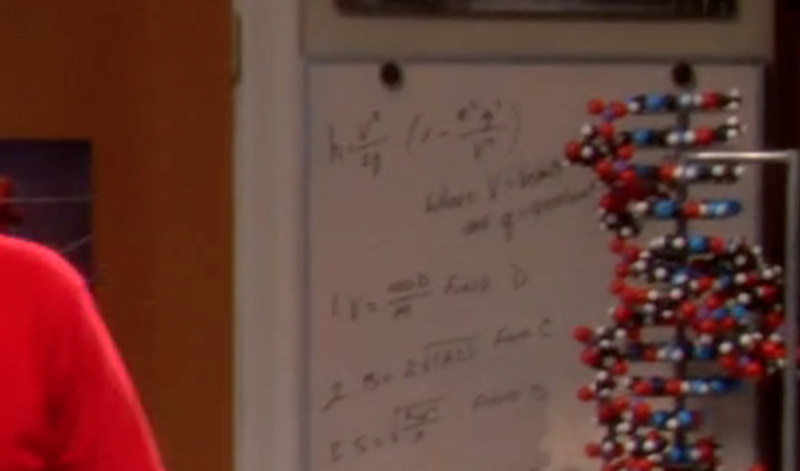 If any of the BBT whiteboards’ dozens of fans had noticed it, they might blame the error on the BBT’s science consultant. We can tell from the words and symbols this is about projectile motion. The problem all started when I tried to figure out what that equation must have meant. In physics we often first understand equations through their units. The variable h is the height of the projectile and is measured as a length, typically in meters. That’s no problem with the first factor v2/2g because that has units (meters/second)2/(meters/second2). Voila meters. The second factor has two terms. The first term,”1“, has no units so we are still in meters. The painful part comes with the next term a2g2/v4. Put in the units and the meter4 cancels meter4. So far so good. But the seconds do not cancel and you are left with 1/(seconds)4. You can’t add that to something unitless. And even if you could, it would change the answer from the nice meters for height something with crazy units: meters/(seconds)4. So it was to my great relief that nobody found this. I did not want to have to answer piles of hate mail or endure the scorn of comments on IMDB. A number of articles have been written about TBBT ruining Raiders of the Lost Ark. But until now, those people did not know what must be the real reason why.